The Glaslift 250 (Geko) window and Glass Istallation robot complies with manual handling regulations. It has a Maximum capacity of 250kg with a working height of up to 2.5m. It will fit through a standard size doorway of just 672mm wide. 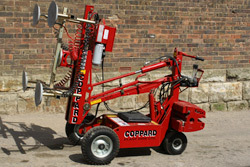 The hydraulic lifting and tilting mechanism is powered by a 12v battery. It allows for interior installation which will reduce crane time and therefore costs.The extendable frame accommodates a wide variety of composite windows and glass shapes. There are 300mm and 500mm extensions available for deep interior mullions. Glaslift 250 (Geko) PV (Powered Vacuum) incorporates a dual circuit battery-powered vacuum system for safety, speed and convenience. Pad spread and depth can be extended as necessary. The ideal machine for composite/unitised windows. Glaslift 250 (Geko) Glass Robot + MRT4 offers 2-in-1 versatility. The dual circuit MRT4 vacuum lifter provides one touch suction and release when used with the Glaslift 250 (Geko) Glass Robot. The MRT4 can also be easily detached to be used as a stand-alone below-the-hook lifter with 320kg capacity. Geko MV (Manual Vacuum) is equipped with manually operated 3-pad suction cups.